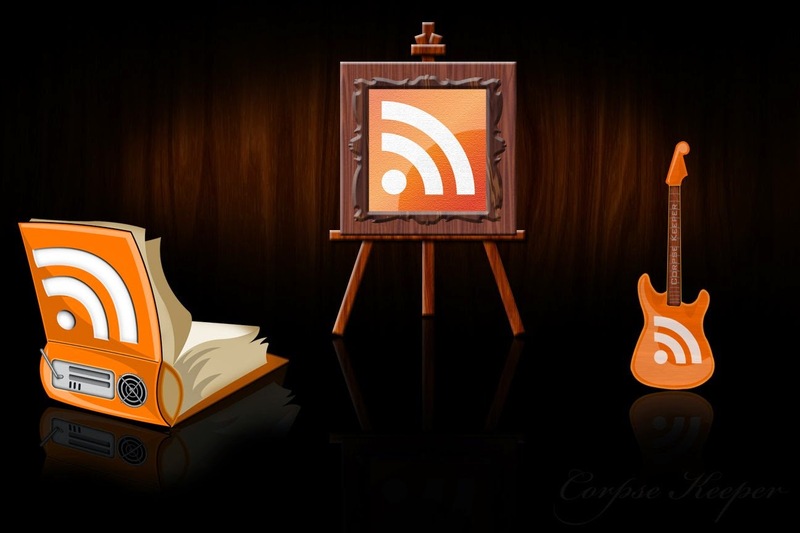 Image: "My Rss Logos" by "Corpse Keeper"
Recently on Google+, I was in a discussion about using feed readers and shared some tips for adding "back door" social media feeds and others, along with general tips. I'd shared some of those 'afore in other discussions, and then I figured, why not collect 'em in a quick post here for ease o' reference? I've been using feed readers for about 14ish (?) years, having started with a desktop program (whose name I no longer remember), then switched to the web-based Bloglines. When it folded, I moved on to Google Reader, and when it died, I tried a bunch of alternates and finally settled on Feedly. I like Feedly because it's got a clean interface; works across multiple platforms; lets you use your Google+ account to sign in; and -- most importantly -- lets you export all your feeds. Exporting is a crucial feature, and I will never consider a feed reader that lacks it (or has no plans to add it). Because if the reader goes bust -- and they do -- and you didn't save your feeds outside of the reader, you're screwed. On the subject of exporting: Take time to regularly export all your feeds (this is done in an OPML file, which is really just a fancified text file containing all the URLs you subscribed to), and store the file of exported feeds somewhere. No Ampersands (&). When using Feedly, you can't use an ampersand "&" in your feed category names. If you put one in, Feedly'll split it into two categories. For example, if you type "Fun & Games" in the category title and hit save, it creates two categories -- one "Fun" and one "Games". I hate, hate, haaaate that. Caused me mucho headaches when I imported my feeds, too. Plan Your Organizing Strategy. Having a logical, scalable organization and good categories is key to getting the most out of using any feed reader. So, take the time up front to think about how you want to organize things, which'll reduce the headache of reorganizing your feeds later. Which, inevitably, you'll need to do. I have about 70 categories and ::cough:: feeds, and I once again find myself needing to break things out into additional subcategories. While I can, of course, follow users/pages directly in Facebook, Instagram, and Twitter, there are cases where I wanna ensure that I don't miss anything from some folks. So, I add their social media feeds in my feed reader. This requires a bit of a fiddling, though, since they obviously want to keep you locked into their ecosystems. Near the lower right of the page's cover pic, click the ellipsis button -- it's the last one in the row. From the pop-up menu, RIGHT-click Report Page, and select Copy link address. TIP: I have a simple text file in which I've saved these feed structures, and I simply pull it up whenever I wanna add a Facebook page feed. Copy/paste the whole resulting URL from Step 5 into your feed reader, and you're good to go. Copy/paste the resulting URL into your feed reader. Go to http://twitrss.me and enter the Twitter username for which you want to generate a feed. NOTE: I've also used http://www.rssitfor.me, but it's been a mite wonky of late. Use whichever works for ya. You are a great resource, thanks so much for sharing this on your blog so I can come back to it.